There are a few different methods to download files from one click file hosting websites like rapidgator or uploaded.net, and each has its own advantages. You can directly download from the official website using your web browser without the need to install any third party software. You can also use a download manager such as JDownloader which automates most of the actions from downloading to extraction without even the need to visit the cyberlocker website that is full of advertisements with fake download buttons that can trick you into installing adware. Another method is by using a web server with a PHP script that is created specially to download from one click file hosting websites. Your web server will act as a middleman to download the files and store them on the server. You can then download the files directly from your web server at any time. This method is most useful when you are unable to achieve a fast download speed even with a premium account due to bad routing from your ISP while a web server located in a data center will normally have a better routing compared to a home connection. Other than that, some company or university firewalls are configured to block anyone connected on the network from accessing the one click file host websites and using your web server to download files can easily bypass this restriction. This method also allows you to share the downloading service with your friends or even charge them a small fee so that they can too use your web server to download files from one click hosting sites. Here are 2 free scripts that can help you download from one click file hosts to your web server. 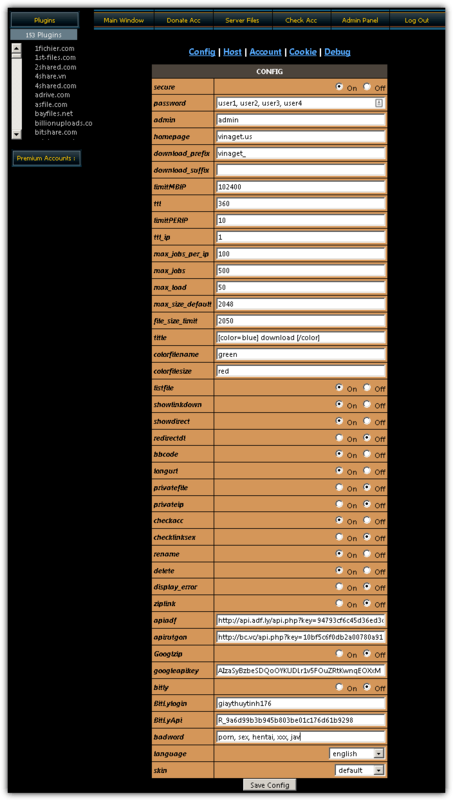 RapidLeech has been around since 2008 and the latest version is maintained by Th3-822. Installing and configuring RapidLeech is as easy as downloading the ZIP file from GitHub, extracting and uploading it to your web server using your favorite FTP client program. Then access the directory where the RapidLeech files are uploaded to using your web browser and you’ll be presented with a one time RapidLeech setup screen. While most of the default settings are acceptable, you should set a secret key for cookie encryption by generating a random string. You should also enable authorization mode if you’ve installed RapidLeech in the root of a domain to prevent it from being indexed in search engines. This is not required if you uploaded the files to a folder with a random name and is not linked to any web page. Depending on the setup of your web server, some may require additional changing of file permissions. 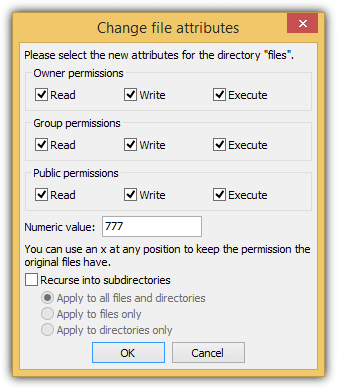 The “files” folder and the config.php file in the “configs” folder must have write permission or sometimes also referred as chmod 0777. This is what RapidLeech will look like after the setup is successful. To start downloading, simply paste the URL of the download link to the “Link to Transload” box and click the “Transload File” button. 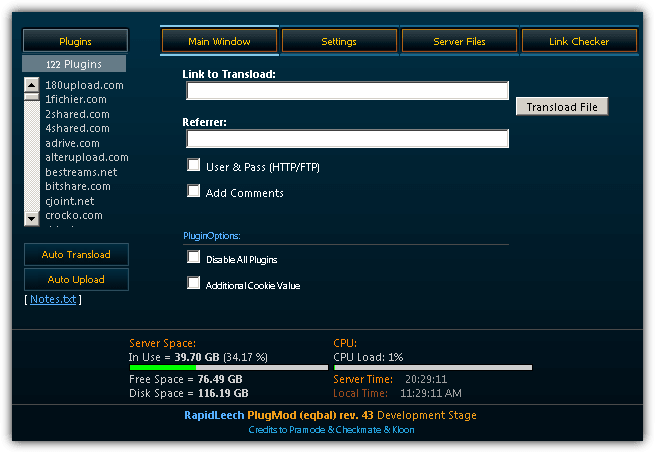 Without any additional configuration, RapidLeech will simply download as a free user and there will be speed limitation imposed by most of the file hosting website. 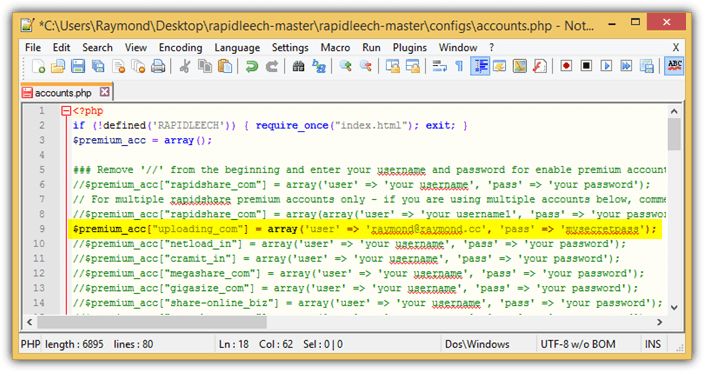 If you have premium accounts, you can enable it by editing the accounts.php file found in the configs folder. Remove the double slash from the beginning and change the “your username” and “your password” to the valid login details of the premium account. Other features such as link checker, multiple actions for downloaded files, sending files to email and enabling proxy settings can be found in other tabs. Do note that RapidLeech can not only handle links from one click file hosting websites, it can also download files from any direct download links. The design of VinaGet is very similar to RapidLeech but it works in a totally different way. For RapidLeech, the files need to be fully downloaded to the server first, then only available to download by the user. As for VinaGet, the user can instantly start downloading after entering the link without even the need to wait for the file to finish downloading. The only drawback is it only works with premium accounts and doesn’t allow you to download as a free user from the one click file host websites. The installation of VinaGet is also easy but with some important steps that must be followed for security reasons. Download VinaGet, extract and upload to your website. You need to CHMOD the data folder 777 while account.dat, config.dat, cookie.dat, online.dat and log.txt MUST be CHMOD to 666. If you don’t do this, the configuration files can be downloaded by anyone and the premium accounts login information can be stolen because it is in clear text! Another improvement in VinaGet over RapidLeech is all of the configuration including adding of premium accounts can be done on the web without the need to edit and upload the PHP file. Simply log in using the admin password, go to Admin Panel tab, and there are 5 different configuration categories. VinaGet can also handle direct download links from other websites that are non cyberlockers. Additional Notes: Some web hosts do not allow RapidLeech or VinaGet scripts and use ModSecurity, a Web Application Firewall to detect and block the script from working. You will probably get the message 404 Not Found or 403 Forbidden when trying to access the directory where you have uploaded the RapidLeech or VinaGet files. You should check with your web host first before using RapidLeech or VinaGet to avoid suspension of your webhosting account. Thanks a lot for informing us about this script. It worked like magic after I had made some modifications in my server’s php.ini. I also benefited a lot from some of the remarks made here. This is awesome. I dont live in an area where rapidshare speed is affected, but this script gives me loads of options. It looks less dodgy downloading from my own domain. Allows me to steal youtube stuff. Awesome! Been using this method to download from rapidshare for a long time, it is a good way since some rapidleech plugmod offer premium account to download too.